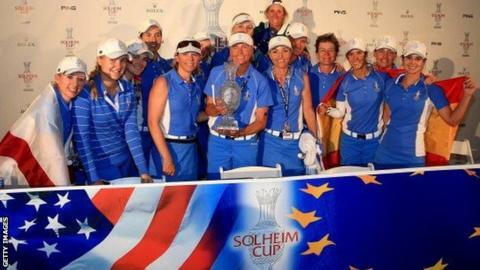 Europe are underdogs for the 2015 Solheim Cup against the United States despite winning the previous two tournaments, says eight-time European team member Catriona Matthew. The women's equivalent of the Ryder Cup began on Friday morning in Germany with Europe chasing a third successive win. Ten of America's 12 players are in the world's top 40 while Europe have three. Scotland's Matthew said: "They are favourites. They pretty much every year go in as the bookmakers' favourites." The 46-year-old added: "We just try to enjoy it. Obviously you enjoy it more if you win but we've been lucky in the last couple, we just need to go out there and give it our best." However, America's Angela Stanford, who is ranked 35 in the world, countered: "I wouldn't consider Europe underdogs. I don't think any team that hasn't held the trophy the last two times could be the favourites." For the first time, Europe will have no rookies in their side and nine of the 12 players who helped Europe win a first Solheim Cup on American soil are retained for this weekend's event at St Leon-Rot, near Heidelberg. England's Melissa Reid and Sandra Gal of Germany, who were on the victorious 2011 team, are joined by France's Gwladys Nocera, who has made three appearances. "I think that will definitely help us," captain Carin Koch told BBC Sport. "They remember that great feeling of winning." America have kept faith with 11 of the team that was comprehensively beaten 18-10 in Colorado in 2013. That means America's Alison Lee is the sole debutant in this year's event. Europe team: Carlota Ciganda, Sandra Gal, Caroline Hedwall, Charley Hull, Karine Icher, Caroline Masson, Catriona Matthew, Azahara Munoz, Gwladys Nocera, Anna Nordqvist, Suzann Pettersen, Melissa Reid. United States team: Paula Creamer, Cristie Kerr, Brittany Lang, Alison Lee, Stacy Lewis, Brittany Lincicome, Gerina Piller, Morgan Pressel, Lizette Salas, Angela Stanford, Lexi Thompson, Michelle Wie. "American golfing teams have been on the receiving end of a hat-trick of hammerings - and another may be heading their way in Germany this week. "But these contests should be taken purely on face value. It is foolish to look any deeper than the result because there is rarely a legacy. "Read more from Iain. Europe are led by 44-year-old Carin Koch, who won two of her four Solheim Cup appearances as a player. The Swede holed the winning putt on her debut at Loch Lomond in 2000 and went on to win 11.5 points from 16 matches. She said: "When you look at the rankings, the Americans have such a strong team. They're so much higher ranked than we are. It will be tough for us but we'll give them as good a match as we can." Seven-time major winner Juli Inkster takes charge of the American team. The 55-year-old won five of the nine events she played in between 1992-2011 and amassed 18.5 points from 34 matches. "Playing in a major is a lot of pressure but playing in the Solheim Cup, the level is raised," said Inkster. "I want my players to have a good feeling about this week and whether we win or lose I want them to remember the ride." Inkster beat Koch 5&4 in the singles at the 2003 Solheim Cup, which was held in Sweden, although Europe won 17.5-10.5. The format is the same as the Ryder Cup with 28 matches - eight foursomes, eight fourballs and 12 singles. Four foursomes are played on Friday morning with four fourballs following in the afternoon. This is repeated on the Saturday, with the 12 singles on Sunday. As defending champions, Europe need 14 points to retain the trophy, while the US must score at least 14.5 to regain it. The first Solheim Cup was contested in 1990 with the USA victorious on home soil; Europe responded with victory in Scotland in 1992. The US lead the series 8-5 but Europe ended a run of three defeats in the biennial tournament with 2011's 15-13 victory in Ireland and followed that with an 18-10 win in Colorado in 2013 - a first triumph on American soil. The event switched from even to odd years following the terrorist attacks in America on 11 September 2001.